Home > Idées > Communiqués > Interassociatif > Frontex : Controlling or Saving Lives? Six days after the “tragedy of Lampedusa”, while the search for the shipwrecked continues and the number of recovered bodies rises daily, the European Commissioner for Home Affairs, Cecilia Malmström, is sending out a misleading message: the solution to prevent the deaths at sea would be to speed up the installation of Eurosur so as to better detect the boats of refugees at sea, and invest additional resources to launch a large scale search and rescue operation in the Mediterranean, coordinated by Frontex. But of what use is Frontex? Why was the boat that sank on the 3rd of October while it was located barely 1 km from Lampedusa not rescued? How is it possible that with 9 patrol boats of the Guardia Costiera, several boats of the Guardia di Finanza, military boats and surveillance aircrafts operating in the area, the boat was not detected in time to avert the fate of the passengers? Up to the 1st of October, a boat of the Spanish Guardia Civil was anchored in the port of Lampedusa. Was it part of the Hermes operation coordinated by Frontex on the morning of the tragedy? And if so, what was it doing while the refugees were drowning? Instead of asking these questions, Italy and European institutions consider that the time has come to re-evaluate the role of Frontex and to grant it further means. We should not be fooled! The mandate of Frontex is combating so called “clandestine” migration and not saving lives at sea. Intensifying its operations in the Sicily Strait will not diminish the number of deaths at sea: 3 300 people have lost their lives near the island of Lampedusa since 2002 , while Frontex is in operation since 2005 and its means have grown from 19 million Euros in 2006 to 85 million Euros in 2013. Even if Frontex’s interception operations at sea are frequently linked to rescue operations, the lack of transparency concerning the activities of the agency do not allow to know if its patrols have truly saved lives, or if they have limited them selves to signal to the nearest authorities the presence of boats in distress. Beyond this, the division of responsibilities in these operations between the European Union and the Member States remains opaque. Who should take over the intercepted or rescued migrants? Who is responsible for guarantying the respect of refugee law and the international principle of non-refoulement? These uncertainties and the absence of clearly defined procedures weaken rescue operations and leave the question of responsibility unanswered. The proposition of reinforcing the presence of Frontex in the Mediterranean and to intensify the cooperation with Libya, reveals the will to deploy more Frontex patrols of the Libyan coast all the while further externalising the management of the EU’s borders. This policy will lead to the indirect refoulement of refugees towards Libya, where the rights of migrants are notoriously violated. Rather than saving lives, the aim is to keep the future “tragedies of migration” far from the eyes and ears of the European public. At the time when, once more, the politicians of the Member states of the European Union consider that the only lesson that can be learned from the 3rd of October wreck in Lampedusa is the need to strengthen the surveillance of its borders, it is high time to stand up against this escalation and say, high and loud that surveillance is not the equivalent of watching over. It is impossible to simultaneously aim to block the “flows” of migrants and watch over them as human lives in need of protection. Never a policy geared at combating “clandestine” migration will be a policy that respects the rights of people. Frontexit is a campaign led by associations, researchers and individuals from both North and South of the Mediterranean on the initiative of the Migreurop network. 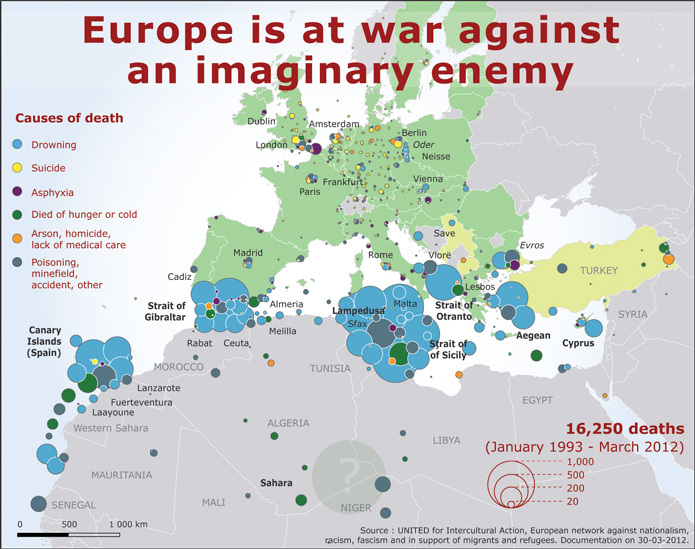 Source: "3300 migrants sont morts à Lampedusa depuis 2002," Jean-Marc Manach, October 2013, based on a cross-section data from United Against Racism and Fortress Europe.